On April 1, they'll even cook it for you. The only reason I listened to our art director, Kevin Goodbar, and agreed to drive up to McKinney at 5 a.m. on a freezing cold Friday morning to participate in our April cover shoot was not for the proffered free breakfast or the chance to be a cover model (in the finished shot you can only see a corner of my shoulder; look for the red splotch on the right). It was for the fact that I could stop afterwards at Local Yocal Farm to Market and pick up six pounds of boneless Black Angus rib-eyes for a girls’ weekend at Cedar Creek Lake. That and a loaf of bread, some chips and salsa, and the best rosemary and sea salt roasted pecans. And a block of cheese and a pound of freshly churned butter, on general principles. I only knew about Local Yocal because a couple of foodie friends of mine invited me to one of their Steak 101 classes hosted by owner Matt Hamilton. After an energetic flag-waving speech about the evils of GMOs and factory farms, the longtime rancher took the rapt group on a tour of the butcher shop, conducted an in-depth course on meat cuts, and provided a seemingly endless sampling of grass-fed, Black Angus, and Wagyu beef, all cooked up with a simple dusting of Chef Milton’s Smoked Atlantic Sea Salt and Pepper Melange on the circular Argentinian-style grill on the patio. Local Yocal will be hosting its Family Style Steak Dinner on Saturday, April 1, at 6:30 p.m. For $65/person, you’ll get three courses of steaks (chuck, loin, and something only referred to as “Wow”), sides, and dessert. BYOB or stop at the Landon Winery beforehand to pick up a bottle of tempranillo (randomly, I spent most of the cover shoot seated next to a lovely gentleman who turned out to be the proprietor of Landon Winery; he says the West Texas high plains vineyards where he sources his grapes mimic the rocky plateaus of Spain). 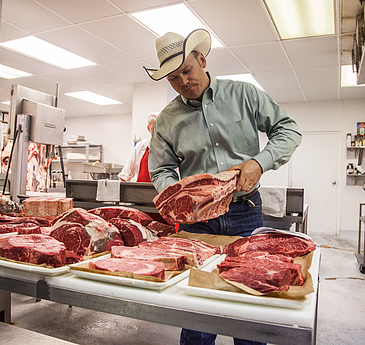 Steak 101 classes ($50/each) are offered most Saturdays now through July.